David Tian sold the Power of Being Asian course to John Tan in mid 2010. John closed down the program in 2011. 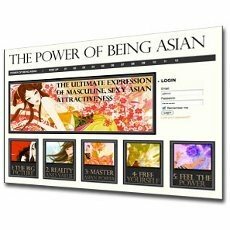 "The Power of Being Asian: Overwhelming Attractiveness and Confidence" is a multimedia course that aims to help Asian Men to meet, attract, and date Asian women. It provides you with the ideas on how to have a lasting change and how to become an authentically attractive, confident Asian man.